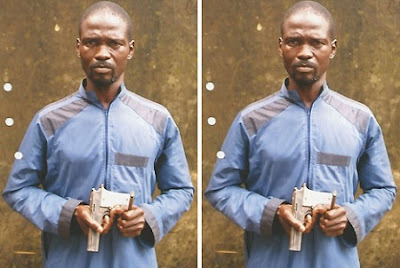 The chairman of the Lagos State National Union of Road Transport workers (NURTW), Ajegunle Branch, Apapa, Lagos, Wasiu Atunse Akanbi, A.k.a Paapa has been arrested for unlawfully being in possession of a Beretta pistol with six live cartridges without the approval of the Inspector General of Police, IGP. Adeniji Adele Road, Lagos Island, Lagos. According to reports concerned residents alerted the police of the illegal weapon when he wont stop harassing, threatening and intimidating them with it. He was arrested and arraigned and was remanded in prison. Deal with him until he speaks the truth.